BlackBerry 7 doesn’t seem to get a lot of high-profile app releases these days, likely because developers are putting the majority of their time into BlackBerry 10. But Dell Voice, which came to iOS and Android earlier this year, has now been released for BlackBerry smartphones, and it’s an excellent app with a ton of great features. Like the other two versions, the app allows you to register a Canadian phone number and make outgoing calls using your data connection. Calls are reasonably priced and features like voicemail and caller ID are free for all users. The service, provided by Fongo on behalf of Dell, allows you to make free calls to many cities in Canada, including Toronto, Vancouver, Montreal and Ottawa, and you can receive unlimited incoming calls from anywhere in the world. It’s actually a great service and I’ve found it preferable to Vonage Mobile, which launched around the same time. The ability to call out from the main dialler using your Android phone, and the clarity of the calls, makes it a better option than Skype for many people, too, if all you’re doing is making phone calls. 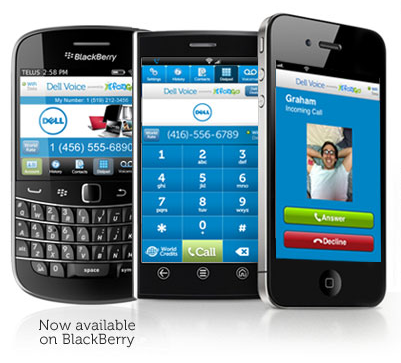 You can check out more about Dell Voice and download it from the BlackBerry App World.